For many years now when I see a building that attempts to be something its not, or is outlandishly playful or misshapen I call it “Disney Architecture”. 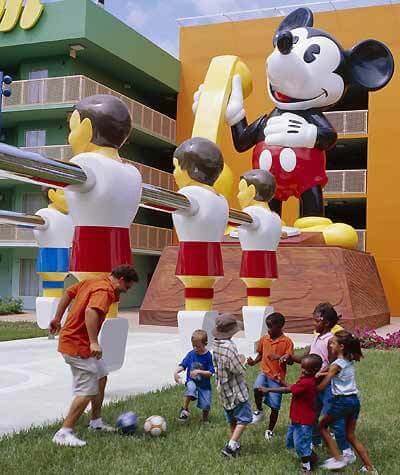 The term isn’t meant to be derogatory towards the architects Disney has employed over the years, including Michael Graves and Frank Gehry, but more a reflection on my own affinity for honest, practical design. Disney has been a master of using design to create illusions, whether it is the forced perspective of main street and castles in it’s theme parks, or the amazing synthetic stone and wood that it creates its attractions with. One of my favorite blogs, Imagineering Disney, recently posted an article that highlights the worst of the worst Disney architecture: The Era of Big and Tacky. Michael Graves’ Swan and Dolphin hotels have received some criticism, but it is a masterpiece compared to some of the weirdness Disney has built in recent years.